Arctic microorganisms represent a huge and unexplored resource for discoveries of biomolecules with a great potential for medical and industrial applications. To see what we are doing in MARZymes, see the film The Cold Rush. This film was made in three days directed by one of the researchers in MARZymes. It was made as part of the Arctic Frontiers Young Scientists Forum video-making workshop in Tromsø, Norway in January 2011. Enzymes are used as additives to cleaning products, as animal feed additives, in food production, for biofuel production and bioremediation. The current enzyme market in the world are looking for novel enzymes which have special features, such as high catalytic activity at low temperature, low thermal stability, salt-tolerance and stability in organic solvents. For economical reasons, low temperature reactions are benefitial for the industry. 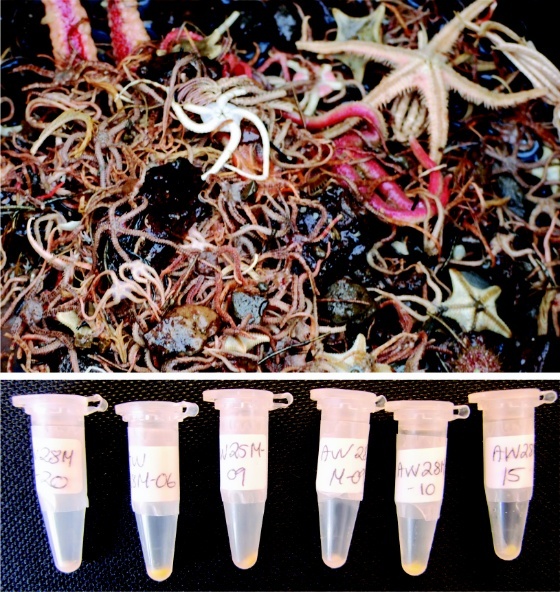 Marine microorganisms represent a huge and unexplored resource for cold-adapted enzymes. MARZymes is all about this, finding marine enzymes which are adapted to extreme conditions in the arctic area - we call them molecules for the future. Marine organisms living in the arctic region have cold-adapted enzymes that display a higher specific activity at low temperatures. Some of these microorganisms are found in the gut and intestines of marine animals in the Barents Sea. About 5-10 % of these microorganisms can be cultured in our lab, and after growth we harvest the cultures in labelled tubes, as seen on the photos above.